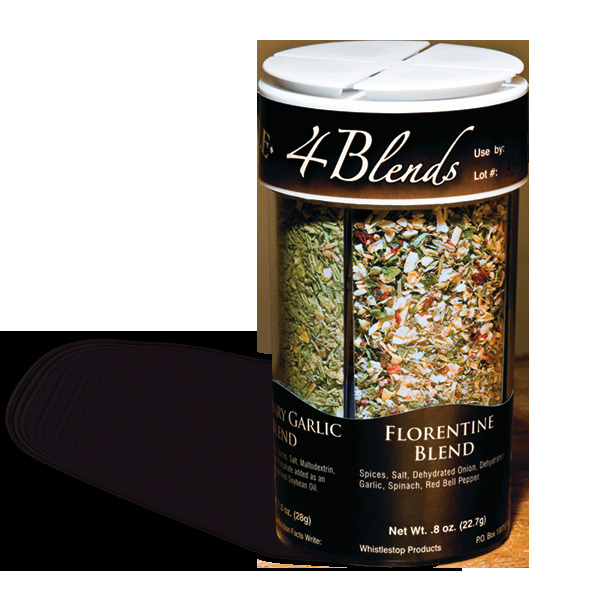 4-Blends Seasoning is a Single bottle with four separate compartments, each with a delicious spice blend that can be used to enhance the flavor of almost any dish that you already enjoy and will help you create new favorites as well. Great on Pasta, Salads, Vegetables, Chicken, Fish. Add flavor to popcorn, baked potatoes and use with olive oil to make delicious flavors for bread dip. Mix some olive oil, vinegar and or wine with seasonings to make your own delicious salad dressings. Uses are endless and flavors are scrumptious. Recipes and ways to use available. Tuscany: A rich harmony or garlic, tomato, red bell pepper and parsley. Try some today. With these options you can use 4-Blends on your choice of sauces, marinades or flavor boosters every day of the week.